Amish Friendship Bread recipe is perfect to share with friends. 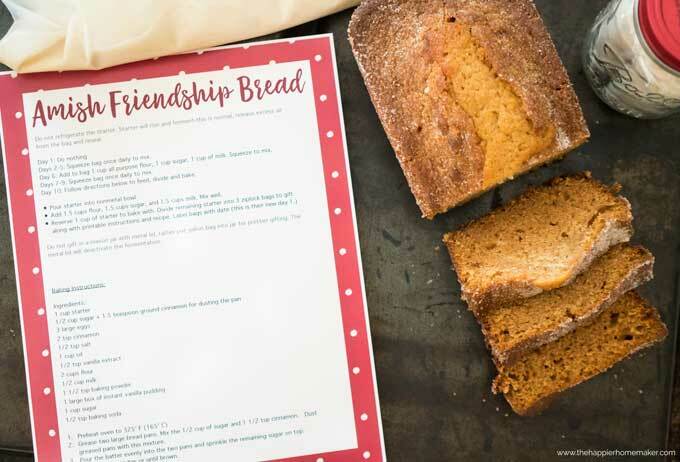 Now you can make your own with this Friendship bread starter recipe & free printable! The other day I was looking through my past emails when I came across an email I had sent my stepmother with an Amish Friendship Bread recipe as well as a Friendship Bread starter recipe. I realized I hadn’t made any in years and years! If you aren’t familiar, Amish Friendship Bread is a sweet bread that you make off a sourdough starter. The starter is “fed” and kept for ten days, then divided into four portions, three of which you can gift to friends and one you use to bake the most heavenly cinnamon sugared bread! Then your friends can pass along the Amish Friendship Bread recipe to their friends and so on and so on indefinitely. When I was newly married I would receive a starter a couple of times a year from friends and neighbors and always enjoyed it. Sometimes, though, you want to make this delicious bread and you need to create your own starter if no one you know has some on hand. 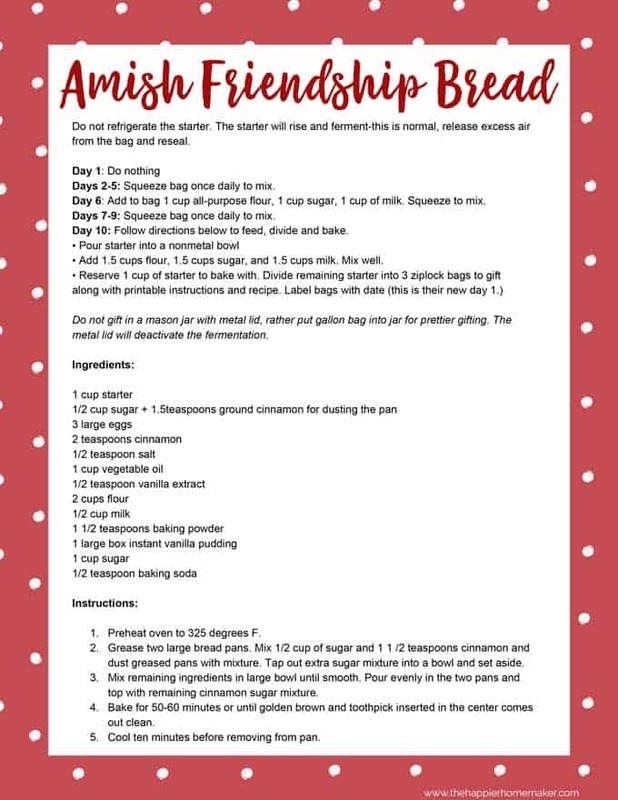 This was the position I was in just before Thanksgiving and since I was whipping it up I decided to share the starter recipe with you all along with printable instructions and the Amish Friendship Bread recipe sheet you can use to gift it to friends and family. It’s perfect for the upcoming holidays as well! 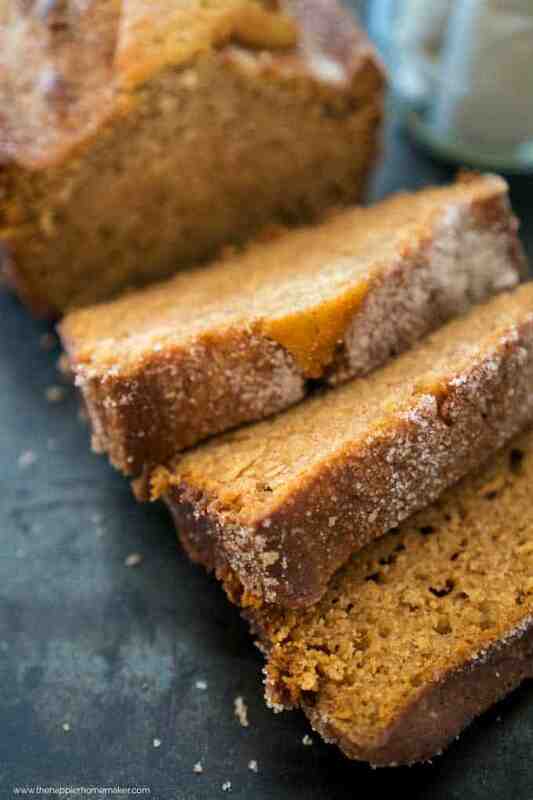 Amish Friendship Bread is the perfect recipe to share with friends. Now you can make your own with this starter recipe along with a free printable for gifting starter to others! In another nonmetal bowl combine flour and sugar and mix well. Slowly stir in milk, then yeast mixture. Allow to sit until bubbly then add to a gallon plastic bag and follow the instructions on the printable. Grease two large bread pans. Mix 1/2 cup of sugar and 1 1 /2 teaspoons cinnamon and dust greased pans with mixture. Tap out extra sugar mixture into a bowl and set aside. Mix remaining ingredients in large bowl until smooth. Pour evenly in the two pans and top with remaining cinnamon sugar mixture. Bake for 50-60 minutes or until golden brown and toothpick inserted in the center comes out clean. Cool ten minutes before removing from pan. When I gifted this set of starter I rolled the plastic bags and put them in standard sized mason jars (with these cute red tops!) It’s important your starter doesn’t touch metal because of the chemical reaction it will cause so don’t gift in the jar without using the plastic bag! Click here to print your recipe and instructions. I printed mine on 80lb cardstock for durability but you can easily print on standard paper as well. You could also laminate it too! 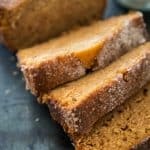 Have you tried an Amish Friendship Bread recipe, there are actually quite a few variations out there. If yours is different than mine I’d love for you to share it in the comments so we can all try it! I used to make Amish Friendship Bread all the time and never used the pudding. Is this really necessary for this recipe? My recipe allowed you to sub vanilla pudding with lemon pudding and lemon extract, chocolate pudding and chocolate extract, etc.. to make a flavor other than cinnamon spice. My friends and family, especially Dad, loved them as they were baked in small individual little loaves. Glad to find your starter recipe to start again. Can I make the bread and freeze it? Yes Barb, the bread freezes wonderfully and thaws quickly. Wrap it in wax or parchment paper whole or sliced and put in a Ziploc bag or container. What constitutes a large box of vanilla pudding? How long is the batter good for in the freezer? I remember my grandmother always kept starters in there..
Seeking the answers to the same questions- how much pudding specifically and can starter be frozen? Many thanks! Is there a way to make the starter and add less sugar, milk and flour on the specified days, just asking because I did not want to have so much of it to have to give away, just enough to use to make. Also, I was given a starter years ago. I assume the person who starts it adds yeast? I never added any yeast, I was surprised to see it listed, I was thinking this long process was what caused the milk/sugar/flour to ferment without yeast? I have used this recipe in several ways. First, I do not use the pudding. I do not use sugar. I use the faux sugar from Aldi’s. I do not use oil. Instead, I use two ripe bananas! I add whatever fruit I have on hand as the predominant flavor– apple, craisin, raisin, blueberries, canned fruit. Every time the end result is different. Every time, the bread/cake is eaten in a hurry. I love this Recipe from Starter bag to finished loaf. I would love to know the Nutrtional breakdown per finished loaf be it large or small. Is there a published Nutrional label somewhere? Thank you, Melissa; basically that is what I thought too. I love this recipe and all the comments; I have gotten from those who received a loaf with a Starter are, overwhelmingly the same. I have even subbed Pure Via and a Gluten Free Flour, in the actual breadmaking steps and in the Topping mixture, for my Diabetic friends. I just advise them now it is a “low sugar added” bread. It works as the Diabetics watch and ration their servings and can still enjoy the wonderful flavorful treat. Thank you again! I wasn’t thinking and used a metal fork to stir my starter. Will this ruin it? Is it normal to have more than 4 cups of starter? It’s the tenth day and I have quite a bit left over after dividing it the 4 ways. Can you bake on the 11th day? Or does it have to be made on the 10th day?